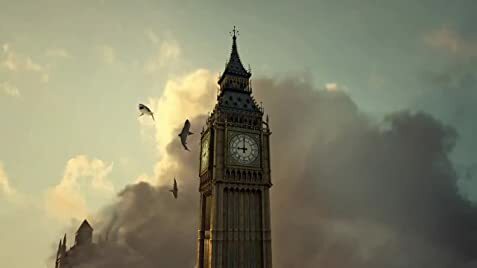 As much as I enjoy campy movies, a genre that the "Sharknado" movies definitely fall under, then I must say that the movie have gradually been slipping down a steep hill with each passing movie. And this 5th installment to the franchise is the worst one of the movie so far. 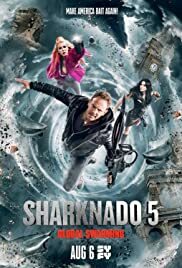 "Sharknado 5: Global Swarming" is a movie that spoofs many other movies, but it fails to do so in a particularly good or funny manner, and that results in the movie becoming strained and forced, and it is clear that director Anthony C. Ferrante is trying to make the audience laugh, but fails to do so in a proper way. The characters in the movie, particularly Fin (played by Ian Ziering) and April (played by Tara Reid) are now jokes and parodies on themselves and their characters in the previous movies. Which makes for a somewhat bitter pill to swallow. Especially the April character whom has turned into a cyborg with superhero-like powers. The dialogue is just downright atrocious in "Sharknado 5: Global Swarming". Mind you, it hasn't exactly been Shakespearian dialogue in the previous movies either, but it is exceptionally poor in this fifth installment in the franchise. It feels like even the main cast have given up because the movie has reached an unfathomable level of ridiculousness. What did work out well enough for the movie was the amount of cameo appearances that took place throughout the course of the movie. Lots of familiar faces to spot, so be on the lookout for those. "Sharknado 5: Global Swarming" is a weak movie in itself and also as an addition to the franchise. If you have watched the previous four movies, you might find some enjoyment in the fifth movie as well. Personally, I didn't really enjoy this one as much as the previous ones to various degree. The ending of the movie, albeit it was so unfathomably corny and cheesy that it was painful to witness, then it was still a fun twist to the movie. It was incredibly stupid, yes, but I must admit that I found myself to be chuckling at that twist to the storyline as it made so little sense for the storyline.